It’s not everyday that students in the formative years of their career development have a chance to speak with professionals working at their dream careers. For Washington Semester Program students, however, such opportunities are ample. In fact, this month our students got up close and personal with three World Bank professionals -- among them a Washington Semester Program alumnus -- in what was a rich and intimate discussion on making waves in the international development sector. Together, WSP alumnus Dr. Achim Schmillen, Rural Development & Labor Specialist Dr. Izabela Leao, and Health Specialist Dr. Federica Secci talked about the impactful work they do around the world, as well as the unique opportunities that are available for young professionals who aspire to work in their field. Schmillen notes that much of why he enjoyed his time with WSP is due to the close relationship his professor - Dr. Christian Maisch - maintained with all his students. Committed to the growth and success of all his students, Maisch is still a professor with WSP teaching foreign policy to students. 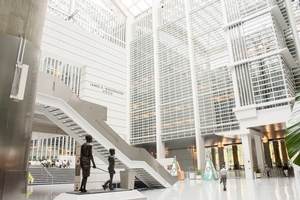 “A good education is a plus, but none of us [at the World Bank] were hired because of the PhD. It’s really about what you do [with your time],” encourages Schmillen.